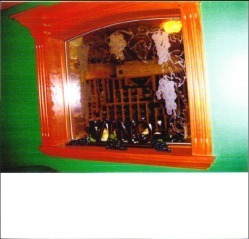 This custom grape pattern was etched on a window. 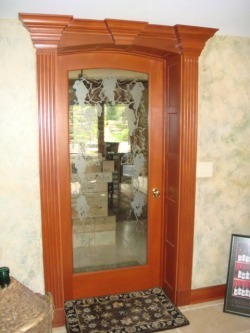 The custom grape pattern was double etched on this inside window with a view looking into wine cellar from hall. 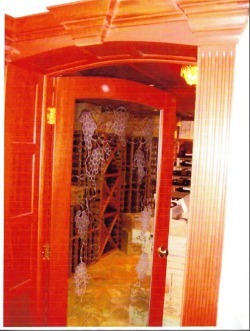 This door was etched with a custom grape pattern for the doors of a wine cellar. 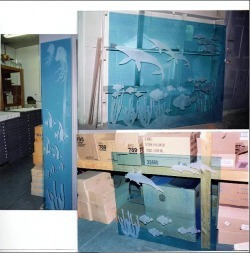 This custom etched pattern of an ocean scene was done for the customer's shower room in their master bathroom. The door on the left was etched for the entrance of a business and the door on the right had the address etched above the door. 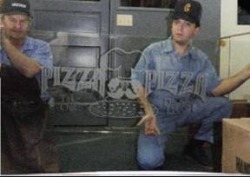 This window was custom etched for a local pizzeria. The top pattern is a custom etched picture of a whitetail deer. 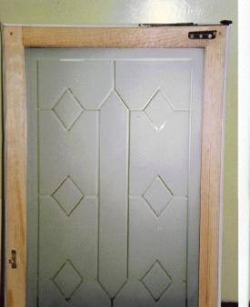 The bottom doors show a solid etch design.